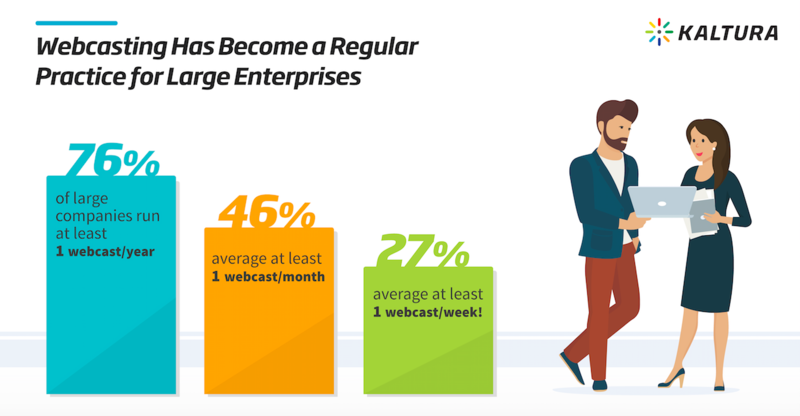 Kaltura’s Latest International survey of over 650 professionals shows that 76% of large companies run at least one webcast per year. Nowadays, the use of video outputs for our many everyday activities, have come on a substantial rise. There is definitely an increase in the rate at which persons, companies, and other organized bodies, are likely to make use of video visual materials, and for different purposes. However, investigations seek to find out how much personal use video materials are being produced, in comparison with those produced for enterprise and business purposes- such as advertisements and training functions. This is the objective of the recently concluded Kaltura’s video survey, which sampled opinions from over 650 industry professionals, from which some form of statistical result has been collated. Kaltura is a well recognized top-notch software company, with its core activities revolving around different video type productions, each of which is carefully tailored to meet the client and end consumer requirements. Due to the company’s ingenuity and aptness in video creation and suggestions, Kaltura is currently considered to be one of the most sought-after video company experts. 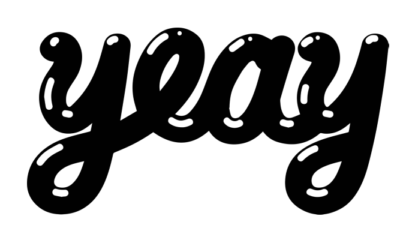 As it stands now, many of their products have served effectively as educational video resource, while a lot more have also found relevance in media service industries, established and startup enterprise fronts, as well as numerous other service providers. 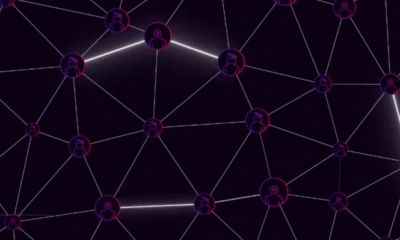 Since its business inception in 2006, the company has built a community of active service users and followers, with its video product audiences now running into several hundred million viewers. Note that, Kaltura has been able to create a positive vibe in video content production, such that schools, homes, and various workplaces, have become constantly attached to its ever innovative video services. Analysts and service users have attributed Kaltura’s products significance, to an unwavering ability to communicate ideas and opinions effectively. This quality has helped organizations improve on their communication tendencies, as well as helped in boosting engagement results between companies and their target audiences. Over the years, the Kaltura company’s business learning and enterprise unit framework, has been credited with much commendations for being able to provide video solutions used within an organization’s framework- for instance training and development workshops, as well as those intended to create an impression on the public. The Kaltura video survey deductions were presented in the company’s fifth edition of its report, that examines video use in the enterprise sector. According to findings, business employees have taken on a tendency to also use videos for activities relating to their scope of work, rather than just limiting same to their personal private uses. 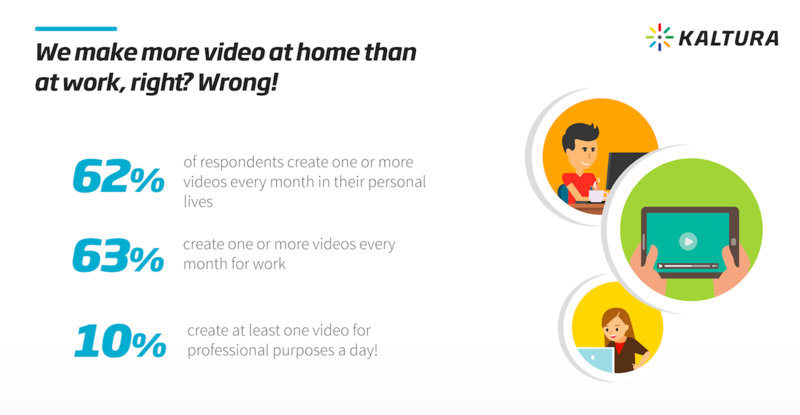 This has become the trend, and while a recorded 62% of the sampled opinion indicated their tendency to create at least a personal video for every 30 days, 63% of them also responded to say that they would also make a professional looking video that aims at performing such functions as adverts, or disseminating information relating to their organizations or particular job concerns. These figures show that although people would still use videos in communicating with people on issues relating to themselves, they would also find it germane to share their business offers and markets to people using the same tool. As such, the subsequent studies are now directed toward understanding the impacts of video materials in business and enterprise activities. Most business owners or employees, tend to readily see the significance in utilizing video inputs for their day to day functions. 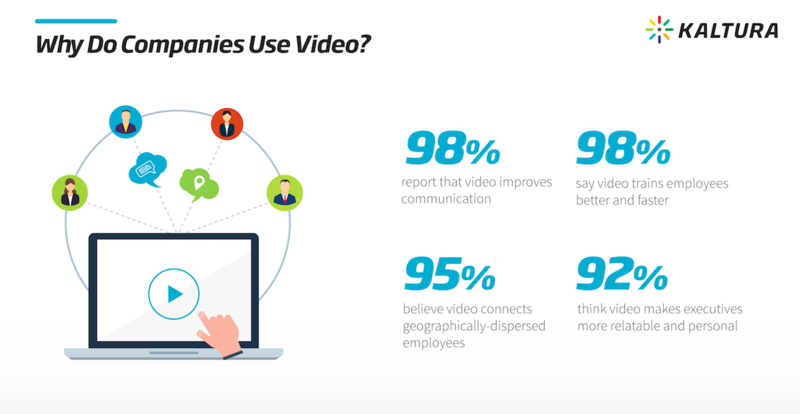 As such, video use popularities have advanced significantly, with a massive 98% of Kaltura’s respondents attesting to the fact that video materials have become well adopted in their organizations’ conducted training sessions. While this figure is largely reflective of the internal training sessions conducted by companies for their employees, it has also been determined that the figures have also risen by an estimated 24% from the year 2017- when considering the use of video tools for customer (external) enlightenment training. All of these and more, have shown prospects for much more video-mediated activities in the near future. They have been confirmed to facilitate quick learning and understanding of a concept, idea, or information. This is a reason why they have proved very useful in the educational setting. Videos are effective in facilitating good communications between persons, hence this is a better way to communicate to people, instead of the use of letters or audio materials alone. Training and communication videos have been discovered to help company executives present themselves in a more relatable and friendly manner- which is good for organizational understanding between all the persons involved. For these reasons and many more, videos are undeniably relevant on the overall, and this would most likely continue to hold true. Kaltura’s methods of service delivery are an added advantage for the company, hence the company may expect to experience very significant profitability in the days to come.